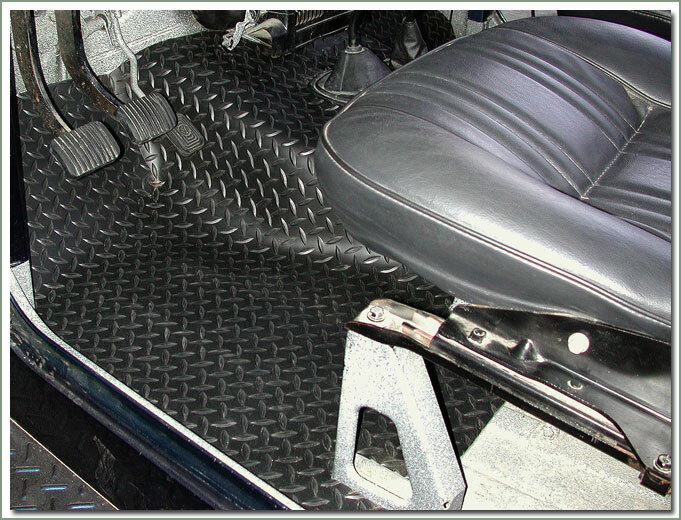 Tuff Liners are a unique one piece floor mat for your FJ40 & FJ45 Cruiser. 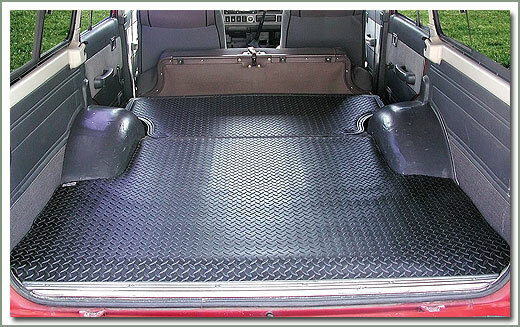 SOR Tuff Liners are made from a commercial grade vinyl product that has exceptional wear characteristics with a cool diamond plate pattern molded into it. 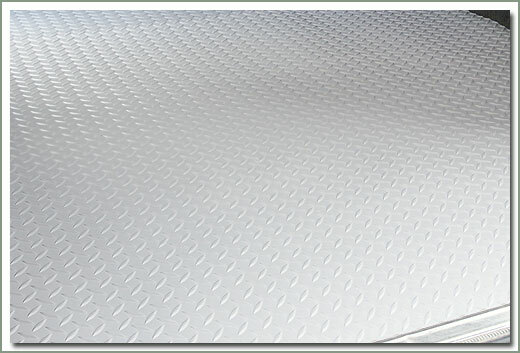 It has good resistance to normal oils, usual household cleansers and common industrial chemicals. 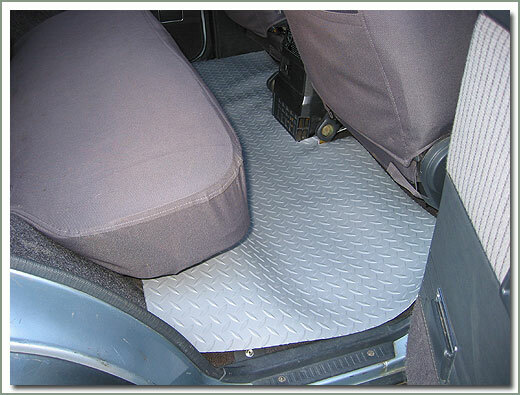 This material also meets the flammability requirements for Motor Vehicle Safety Standards. Minor trimming required for shifter holes. 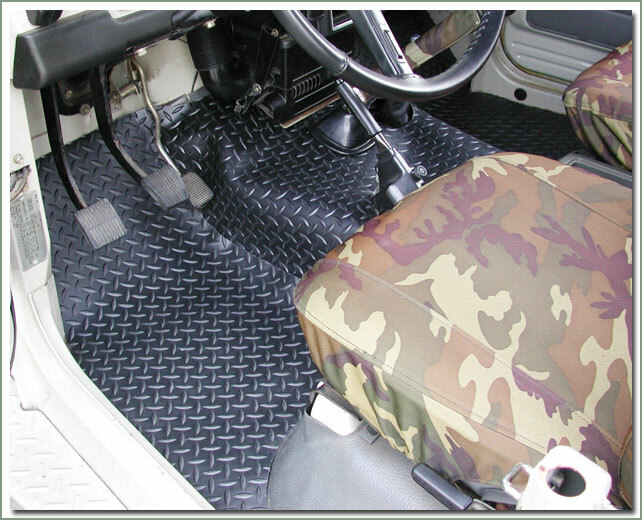 There is also a matching SOR Tuff Cargo Liner. 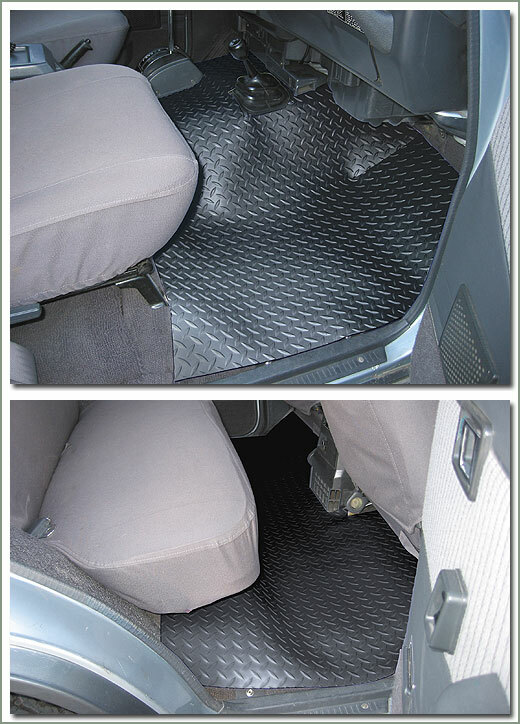 Rear cargo liner is not cut out for factory rear heater. 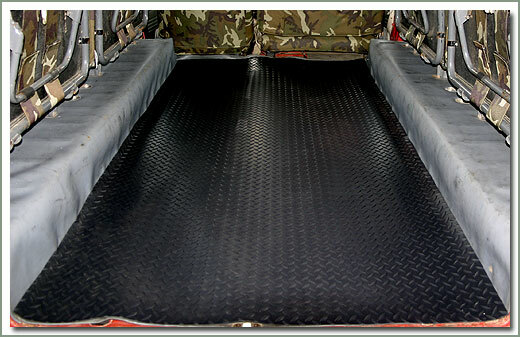 Available in Black Tuff Tread material. Fits 1/90-1997 80 Series - Black. May require trimming. 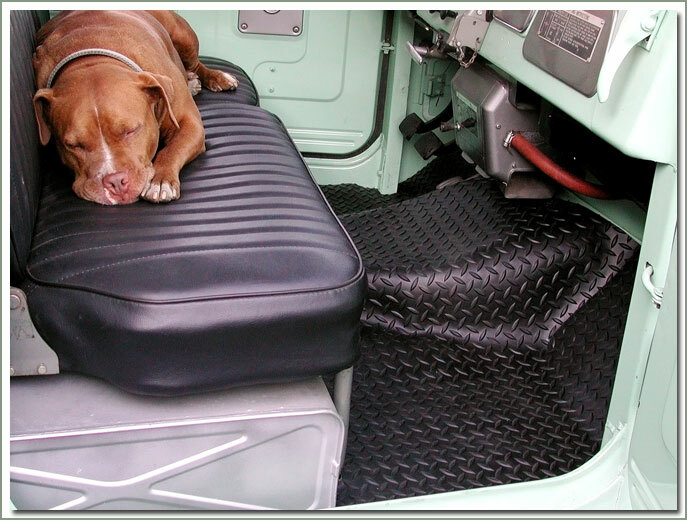 No returns on cut cargo mat. 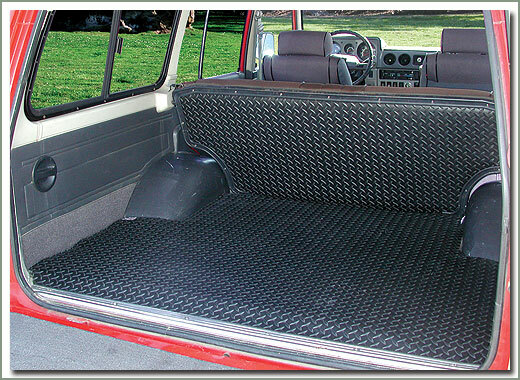 Specter can offer FJ60 & FJ62 wagon owners an attractive and durable SOR Tuff Tread Floor and Cargo Liners. 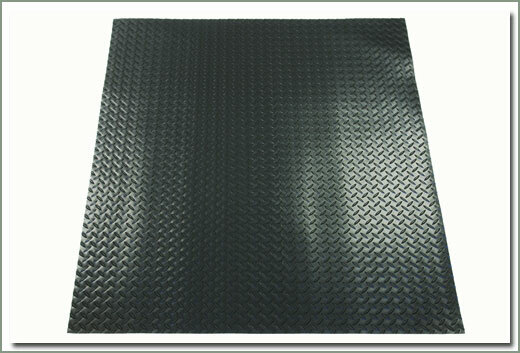 Tuff Tread is a uniquely engineered diamond plated vinyl matting. 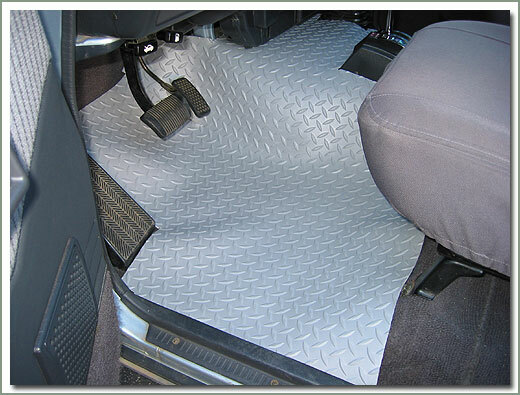 For those of you who are looking for more coverage and protection than a carpet mat or a floor mat can give, these new liners are the perfect solution. 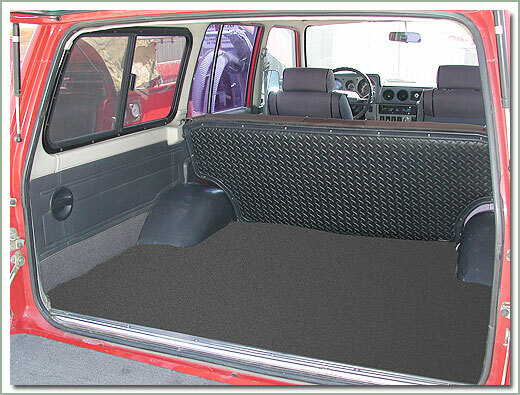 SOR Front Tuff Tread Liner is a one piece mat which covers the entire front area floorboards. 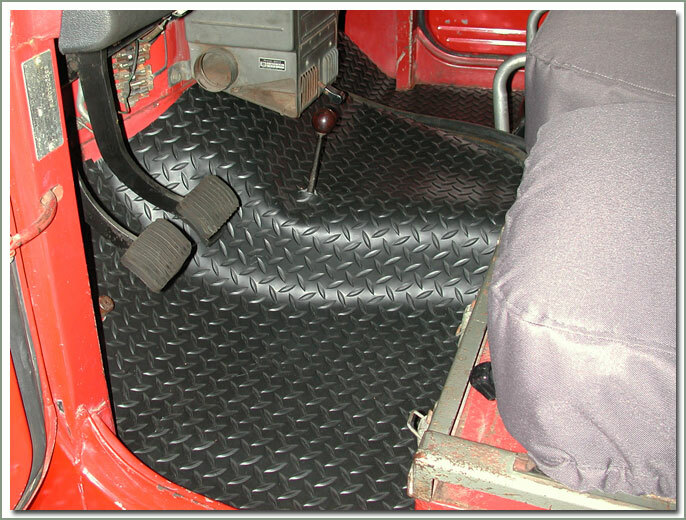 The 60 Series mats are marked for manual transmission, and the 62 Series are marked for automatic transmission, cut outs are required for installation. 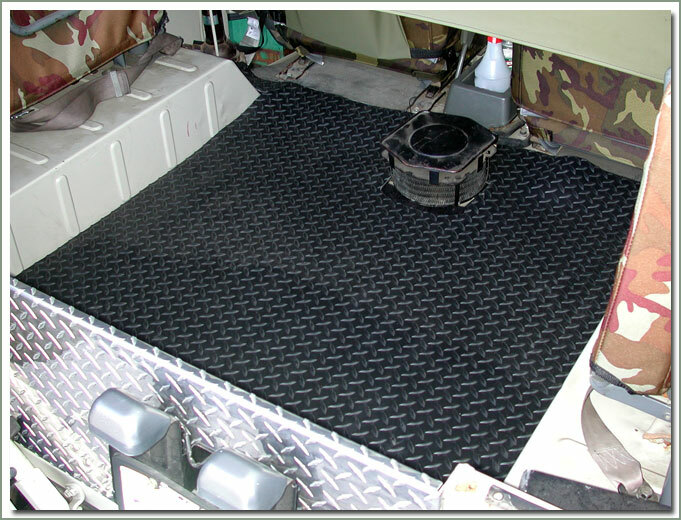 SOR Mid Passenger Tuff Tread Liners cover the foot well area from door to door, this mat requires trimming for your specific year and the coverage you desire. 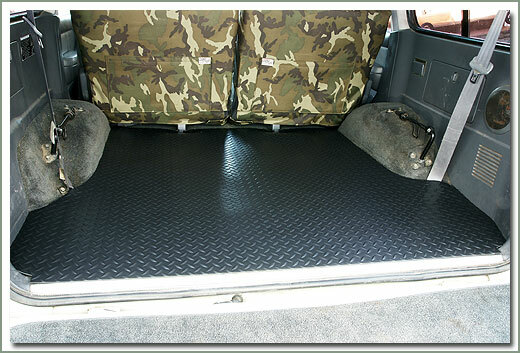 Specter also offers the matching Tuff Tread Cargo Liner which covers the entire cargo area and can be installed under the cargo area trim plates for secure fit. 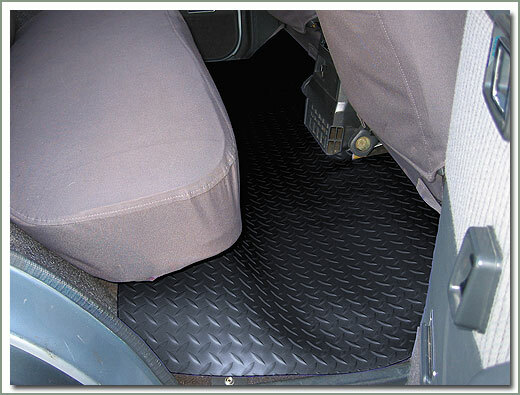 The Tuff Tread Rear Back Seat Liner is designed to cover the back of the passenger seat, and installs under the trim plates. 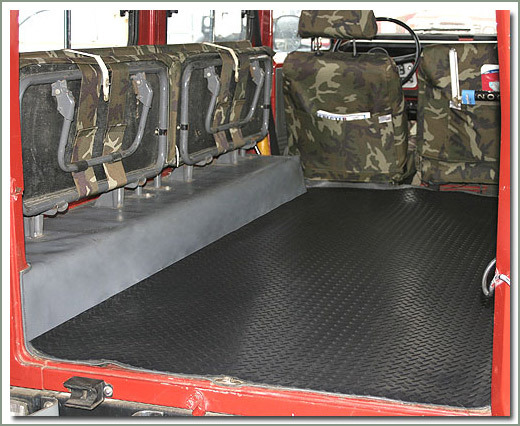 When you fold down the passenger back the entire floor area is covered. 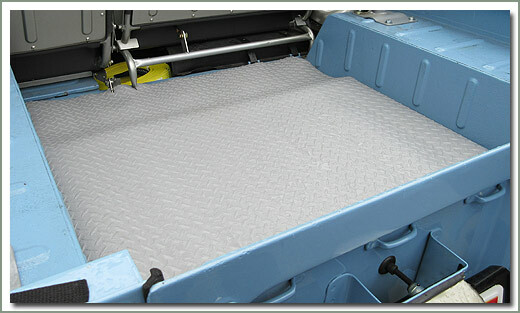 These mats are easy to trim by using a matt knife or scissors. 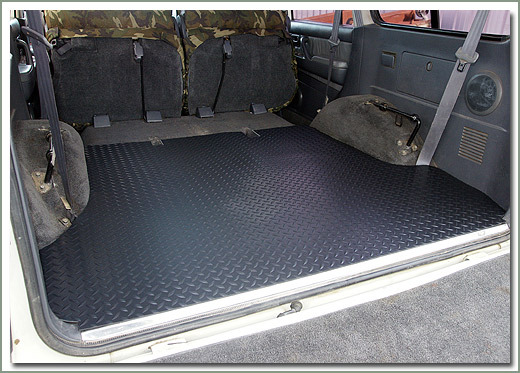 Perfect for the outdoors person who need the space to carry a lot of gear and equipment. Great for people who surf, snowboard, hunt, fish, etc. who need to carry wet or damp gear. 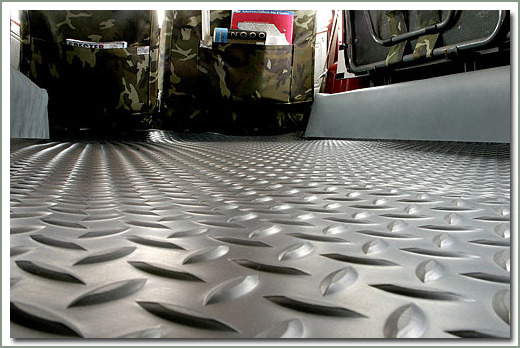 Tuff Tread material provides a commercial grade vinyl product that has exceptional wear characteristics with a cool diamond plate pattern molded into it. 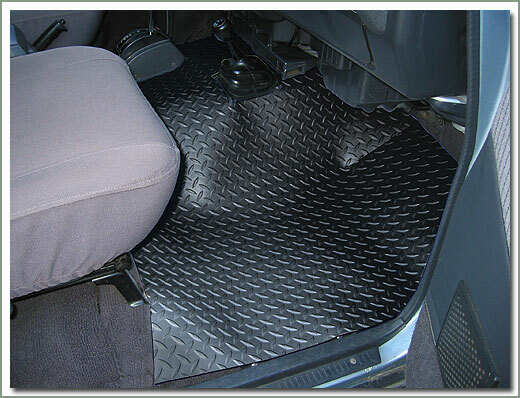 It has a good resistance to normal oils, and meets the flammability requirement for Motor Vehicle Safety Standards. 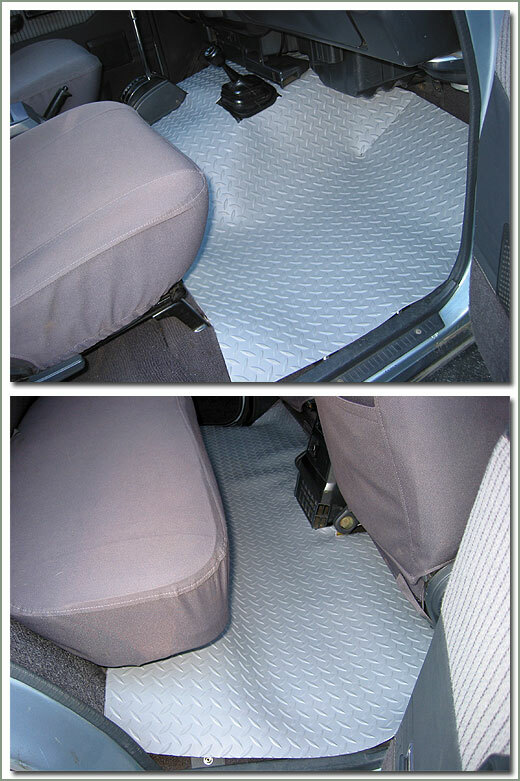 Easy to vacuum, and wipe clean. 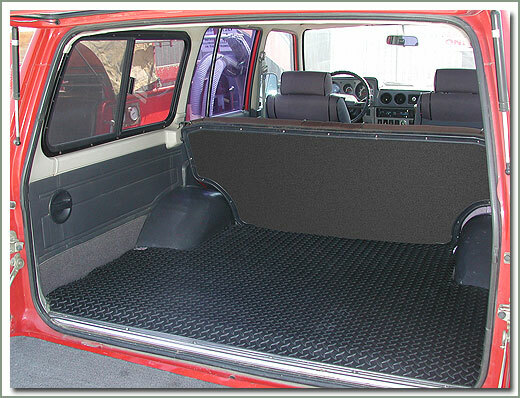 Available in Tuff Tread Black (BL), or Gray (GY).